Order a mixture of white egg laying chickens in this assortment and see which breeds are your favorite. We include our favorite white egg laying chicken in this assortment. Order a mixture of white egg laying chickens in this assortment and see which breeds are your favorite. We include our favorite white egg laying chickens in this assortment, and we guarantee that your assortment will include at least 3 different chicken breeds. 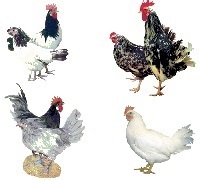 Breeds that could be included in this assortment are: Ancona, Black Sumatra, Blue Andalusian, Exchequer Leghorn, Golden Campine, Light Brown Leghorn, Silver Lakenvelder, Silver Spangled Hamburg, and White Leghorn.